To what extent has Canada's concept of the Arctic influenced other Far Northern areas of the world? Historically, the term “Arctic” was mainly ascribed to the Arctic Ocean and its immediate vicinity, focused on the High Arctic. 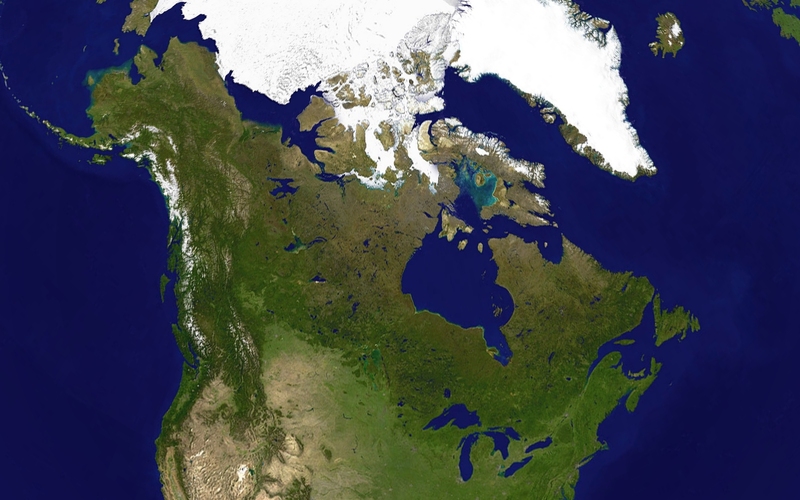 However, when Canada started to describe its land areas above 60° North latitude as “Arctic”, the notion of what could be described as “Arctic” changed, argues Professor Carina Keskitalo from Umeå University. Partly due to its troubled domestic developments in this region, Canada became a driving force in the development of the Arctic Council, which institutionalized the concept of an “Arctic region”. As climate change and economic interests have increased the political significance of the region, such historically developed notions of “the Arctic” have been transplanted to northern areas everywhere, with little reflection on whether it is applicable to the different regions or not. In this interview, Professor Kesikalto describes the results of a discourse analysis and the evolution of the notion of what is considered "Arctic". In your writing about Arctic region-building, you suggest that the Arctic has come into being through political discourse. You argue that “the Arctic” is a perception of the region, associated with characteristics like a remote and clean, pure environment and indigenous subsistence-based livelihoods. Is our understanding of “the Arctic” today just the result of speaking it into existence? To a large extent, I think this is the case. A region is not a given, it is politically constructed. Canada actively developed a specific understanding of its “Arctic” quite early. The country has been involved with Arctic work for a long time, but critics in Canada say the Arctic discourse is just a tool to come to grips with the country’s vast environment. Canada was established as a federal state with the delineation we know today only in the late 19th century, at a time when geopolitical understandings of the world and research in the Antarctic were quite popular. Partly for this reason, in the early 20th century when the Antarctic largely came to be understood as a region below 60° South latitude, Canada chose the idea of the Arctic as a region above 60° North latitude. This reflects a geopolitical, major scale understanding of the world, and also its division into distinct parts. However, the delimitation of the Arctic as an area above 60° North is not very helpful for understanding what is particular to this region. Choosing the 60th parallel is rather arbitrary; there is nothing that fundamentally distinguishes the region between the 59th and the 60th parallel. Similarly, while the Arctic Circle at 66° North delimitates the limit of the midnight sun in summer and the polar night in winter, neither of these factors necessarily reflect cultural life or environmental features. Treeline and marine delineations also exist, and each of them defines the Arctic differently. Maybe these delineations reflect our ideas that we need to define something as “Arctic” – perhaps, as something beyond which “there be dragons”, as old maps use to say. What characterizes Canada’s historical perception of its northern region? In Canada, the North was largely perceived as a pure, untouched environment, inhabited exclusively by a subsistence-based indigenous population. Many Canadian scholars have noted and criticized this, for instance Rob Shields and Ken Coates. Canada’s notion of the “Arctic” also has always been tied to the frontier mythology. While the “frontier” moved from the East to the West in the US, it was a northwards movement in Canada. In the 19th century, the aim was to transform nature and wilderness of the frontier into civilization. Even today, the untouched environment and the indigenous subsistence-based population seem to be the two key features of how the Arctic is understood. The frontier idea was widespread in Canada and the US/Alaska, and could perhaps also be seen as having impacted understandings of Greenland and of the Russian north. Norway, Sweden and Finland, however, have been inhabited by different peoples – indigenous as well as non-indigenous – for a long time. In this European “old world”, the state has been established for a longer time than in North America, and there was no comparable frontier conception. The use of a frontier concept has even been brought up and discarded in Norwegian literature. Nevertheless, you argue that this type of historically established and Canadian Arctic notion became internationalized through the Arctic discourse. After the Cold War, the development of an Arctic political region took place as part of the effort to set up international cooperation between the East and the West. To address issues such as conflicts with the US and domestic indigenous peoples’ claims for political power, Canada looked for ways to increase cooperation with other Northern countries. Already in the 1970s, discussions existed within Canada of an “Arctic Basin Council” consisting of Norway, Russia, Denmark-Greenland, the US and itself – the group of Arctic coastal states that is labeled the “Arctic Five” today. Such cooperation was not possible at that time due to Cold War tensions. At the end of the Cold War, as cooperation across the previous East-West divide became very prominent in state considerations, the situation was different. During the Cold War, Norway, Sweden, Finland, Iceland and Denmark had increasingly described themselves as part of a Nordic Council, so it was necessary to include the entire group in cooperation when Canada again took up the Arctic Council idea. The fact that we now have eight Arctic states is more or less a coincidence, originating from the initial post-Cold War period. It is a result of political negotiations. This is why I argue that “the Arctic” is not a given region, but rather has evolved through a political region-building process. When establishing Arctic cooperation, the Canadian understanding of “the Arctic” was the most developed – especially with regard to international literature - and became the driving notion in political developments. Subsequently, Canada’s perception became internationalized. Why might the historically developed perception of the Arctic be problematic? The Arctic discourse that has been shaped historically lays heavy emphasis on a pure environment and subsistence-based indigenous societies. This is not an accurate description of the “Arctic region”. There are big differences between the North American and the North European context, for instance. It is as if you take the EU and say “all countries are the same”. The “Arctic” countries have gone through very different historical developments. The “Arctic region” is no monolithic bloc, yet essentialist features like the "pure environment" and a "traditional lifestyle" are still dominant in Arctic discourse. For instance, when the Canadian indigenous peoples are described as being dependent on subsistence, this is often described as their natural, self-determined traditional lifestyle. But due in part to the European Union’s trade ban on seal products, indigenous peoples in northern Canada cannot sell to EU countries products derived from marine mammals. The discourse and the literature often omit that subsistence lifestyles in these cases are not a given; they are legislatively enforced. In northernmost Europe, indigenous peoples neither live in reservations nor depend on a subsistence economy. In Norway, Sweden and Finland, reindeer husbandry – which is often seen as the most emphasized indigenous industry, although non-indigenous persons in Finland practice reindeer husbandry as well – is market-based and largely industrialized. Reindeer herders use snowmobiles, trailer trucks and sometimes helicopters to monitor and tend their herds. They live in towns and not on reservations. It has little to do with externally idealized images of a traditional lifestyle. And Iceland does not have any separate indigenous population. It holds one of the world’s oldest cultural heritages as a state, but is extremely integrated in the world economy, as the recent economic crisis illustrated. The idea of the Arctic as a pure environment with only indigenous people living there does simply not apply to the Nordic countries, where the indigenous population only accounts for a very small minority of the northern population. In northern Europe, the indigenous and non-indigenous population is well blended; they have been living together for centuries. Today, one may even ask whether the idea of the Arctic applies anywhere in the Arctic at alll. With increasing globalization, applying a perspective guided by ideas of the “Arctic” bears the risk of ignoring large changes in terms of industrialization and post-industrialization, and trying to “lock in” areas in time. What data and sources did you use when analyzing the Arctic discourse? The discourse analysis drew on literature on the Arctic to see how the Arctic is defined, and how the literature talks about it. Arctic libraries like the Scott Polar Research Institute in Cambridge or Dartmouth College in the US provide a lot of Arctic literature to study the discourse. I looked at who uses the term “Arctic” to describe the region. Some of the analysis also draws on Arctic Council documents, especially on discussions at the time in the Sustainable Development Working Group (SDWG), and documents relating to the establishment of the Arctic Council itself. Canada was a driving force behind the establishment of the Arctic Council in 1996. The Council’s composition of eight states and the delineation of the Arctic as everything above 60° North were the starting point for my research. I also wondered why there is this strong focus on indigenous peoples and the environment. In Northern Sweden, you would expect a focus on regional development, different economic sectors, and employment, as I have showed in later studies comparing domestic and international understandings of northern areas. However, at the time I did the broader Arctic discourse analysis, much of the “Arctic” literature I found - for instance articles in journals in the field - were Canadian, and moreover written by southern Canadians rather than the northern indigenous peoples that had been placed in focus for discourse. This was highlighted in a study of what authors published in the journal Arctic, published by the Arctic Institute of North America. Influential academics in this field like Oran Young also influenced the development of the Arctic region with a focus on the environment and indigenous peoples. How does the discourse on the Arctic affect policymaking? It affects policymaking in that it seems anything that is brought up under the label “Arctic” is given a particular flavour. For instance, the EU has different existing programmes that address regional development in most EU regions, including northern Norway, Sweden and Finland. However, as soon as the EU started to develop an Arctic policy, a very different approach was taken. The first drafts on the EU Arctic policy mainly focused on marine offshore areas and oil and gas, things that only apply to parts of Norway, and not to the EU members states Sweden and Finland at all. When Sweden commented on this and emphasized the land areas and activities such as forestry, the draft was edited to a certain extent – but EU Arctic policy still looks very different from the regional development programmes. The EU documents also draw the border of the Arctic region at the same point where some Arctic Council documents do, at the Arctic Circle. This is rather absurd, as there is nothing in northern Sweden or Finland that justifies this delineation. There are no administrative counties or municipalities in these countries using the Arctic Circle delineation, but now the EU does so to define the Arctic region. It thus seems that when developing its Arctic Policy, the EU mainly drew from international sources talking about Arctic issues. It incorporated this international approach into its own policy, even though it did not reflect the conditions of its member states. It is understandable that the EU seeks to position itself in relation to climate change and oil and gas resources, as these have been a crucial focus in international Arctic discussions. With regard to political positioning, a nuanced adaptation to the North European context may not have been a priority. However, it is surprising that the same geographical areas are described very differently in the regional development context on one side and the Arctic context on the other. In your book, Negotiating the Arctic, you wrote that “the Arctic has been conceived of as something apart from this world, an area for exploration and exploitation (….). One does not stay in the Arctic: one uses it for something, or ignores it.” Is this still topical today? Yes, to the part that the term “Arctic” has even been used to signal something external. “Boom and bust” developments that have been more regular in North America may relate to that: moving up to the North, building a mine which is then abandoned when it has been exploited. It may even be relevant for the oil and gas development in some cases. However, I think it has been less applicable for the European context, maybe because delineations in this case have not been as strongly external as those of the “Arctic”. For instance, one of Europe’s largest iron ore mines is located in Kiruna in northern Sweden. People moved there largely from the neighboring areas and the mine has been running for more than hundred years. The way in which resource use is developed is thus not a given – it is a result of political and economic priorities and frameworks. In the case of Canada it is also striking that the northern areas are historically institutionalized as “territories” instead of “provinces”, which resulted in less self-governing power. Constitutional differences causing inequality between northern and southern areas raise questions about how the North is perceived in Canada as well. How do North European states apply the term “Arctic”? One of the last “Arctic” states to develop a national Arctic strategy was Sweden, in 2011. Historically, Sweden has never been an Arctic state; it has not perceived itself as “Arctic”, at least. The recent international attention towards Arctic issues and the involvement of the EU has triggered the need for Sweden to develop a political position towards the Arctic. This is why I think the term “Arctic” in the discourse on northern areas has travelled from international discourses on the Arctic to the EU and then to Sweden. When Sweden felt obliged to use the term “Arctic”, the international discourse offered some orientation. This influences the way Sweden talks about the Arctic. Having an “Arctic Strategy” also means to agree to and take part in the international Arctic discourse, and this may change the focus. To give another example, the Arctic Council’s Arctic Human Development Report from 2004 says very little about Norway, Sweden and Finland. A study comparing the breadth of existing research in Sweden with the image presented in this report showed that there is a lot of material on the situation in Sweden in regional development studies that just have been ignored by the report. So your argument is that the northern European states need to develop their own relationship with the “Arctic” in their own, individual way? To a certain degree. Relating to the international discourse may be necessary to position oneself with regard to issues of resource extraction and climate change. But apart from that, I cannot say why these countries should import a term that has so much baggage. People often think of the Arctic as a remote place where polar bears live, and this image does not fit to the reality of the places that are now considered “Arctic”. In Canada and the US, universities offer “Northern Studies” or “Arctic Studies”. Similar programs are developing in Europe as well. We now have an Arctic Research Centre here at Umeå University. This development is also partly a result of the Arctic positioning of Sweden on the policy level, and it means we have to relate to this term. I think we should not take the baggage that comes with it; we need to focus on what is relevant to us locally, but not import non-applicable ideas from elsewhere. The Nordic countries have been discussing the areas now described as “Arctic” in many different ways already. We do not start from scratch; there are many written documents available. When talking about northern areas, we need look at domestic understandings of specific areas. Could you give an example of what “Arctic Studies” in the northern European context might address? There is a lot of research activity regarding many different areas of relevance both on the county and municipal level in northern Europe. Forestry, for instance, is practiced in northern Sweden and Finland – and would thus constitute a resource use sector of broader “Arctic” relevance here. As in many other sectors, forestry has become more intensive due to increased global competition. While many people were locally employed in forestry earlier, they have been replaced by mobile teams travelling between areas. These mobile workers do not have permanent contracts with the forestry companies. As a consequence, forestry has increasingly become disconnected from local employment. Even though it still provides a high value to GNP (3%) and Sweden’s export value (10%), it has been losing support among the country's population. Changes in conditions that may increase with climate change are other factors affecting forestry. Northern Sweden traditionally does not have many winter storms because it is too cold, but we observe an increasing number of winter storms nowadays. Trees with a shallow root system are damaged more easily when the ground is not frozen. Changes like these may result in growing problems. Drawing upon its Arctic Futures projects, Mistra, the Swedish Foundation for Strategic Environmental Research, recently initiated an “Arctic Sustainable Development” research project, of which I am the scientific director. It is the first major Arctic social sciences and humanities programme in Sweden. What is the Mistra Arctic Sustainable Development Programme going to address? Our recently finalized research plan comprises more than a hundred pages. Northern Norway, Sweden, and Finland are our focus areas, as they are under-researched in the Arctic context. We will make some specific comparisons also with cases in northwest Russia. My colleagues and I will look at the characteristics of these areas from a sectoral as well as municipal planning perspective. We plan to examine the intersections between oil and gas, mining, forestry, fishing, tourism, and reindeer husbandry as relevant in the cases. There are lots of different intertwined interest groups and actors. Sectors ultimately utilize the same areas, which causes conflicts of interest - even though people may be friends on a personal level, and for instance some in reindeer husbandry also have supplementary work in forestry or mining. Much of Sweden is utilized for forestry, and some 40,000 - 60,000 small-scale forest owners own land in the same 40% of the Swedish land area that is utilized by about 2,500 reindeer herders. There are thus large differences between sectors, both in terms of size and economic strength. Mining and other interests are of course also important in this area. These overlaps of interest cause tensions in the region. This area is very multi-faceted and interest-dense, resulting in very vivid discussions over priorities amongst different interests. Our research seeks to move the focus away from the largely Canadian focus on indigenous subsistence economy when talking about northern areas. While our work may be published under an Arctic heading, I think it is very different from current Arctic discourse. E. Carina H. Keskitalo is a Professor of Political Science at the Department of Geography and Economic History, Umeå University, Sweden. She has published extensively on the development of the Arctic as an international region as well as on environmental policy including climate change adaptation in northern Europe. She is currently the scientific coordinator of a new Swedish social sciences and humanities programme, analysing the development and interaction between different natural resource use sectors in northern Europe based on constructivist perspectives.